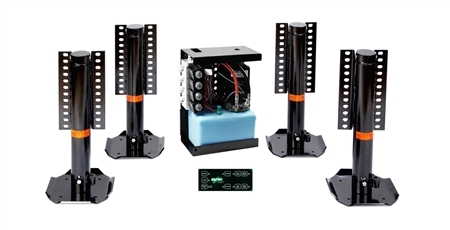 The Bigfoot PC-MB4 Platinum Automatic Leveling System was designed specifically for Class-C motorhomes on a Mercedes chassis cab. The weatherproof hydraulic power unit with an American made marine pump and motor wrapped in a steel housing, allows the unit to be mounted outside in the elements so it does not take up storage space. No drilling, no relocating the spare tire and no rerouting the rear exhaust is needed for installation.